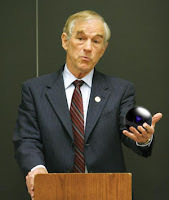 I have to admit that until the first GOP debate of the new election cycle I had never heard of Congressman Ron Paul. In my pre-debate post, I said the following about Mr. Paul: "Texas Congressman. A Republican that voted against the Iraq War. Don't give him too much credit, though. He votes 'no' on everything." I got a few Paul supporters who stopped by and pointed out that he represents what the GOP is supposed to be -- more individual freedom, smaller government, yada yada yada. Same old song and dance. Then I heard MSNBC's wingut blowhard Tucker Carlson singing Paul's praises on his show, and saying that he voted for Paul for president in 1988. That, right there, is enough of a reason for me to run away from Paul -- very fast. Sure he is against the Iraq War and was the only Republican to vote against it in Congress. Some on the left have embraced Ron Paul because of this and becuase of his criticism of the Bush Administration in general. They shouldn't. Be very wary of supporting Rep. Ron Paul. He may seem like an a-typical Republican (and he is to a certain extent), but he is no liberal. It has recently come to light that Mr. Paul has been publishing a rather revealing newsletter for many years that highlights his radical views on a number of topics, especially minorities. On reducing the age kids (specifically black kids) can be charged with crime as an adult: We don't think a child of 13 should be held responsible as a man of 23. That's true for most people, but black males age 13 who have been raised on the streets and who have joined criminal gangs are as big, strong, tough, scary and culpable as any adult and should be treated as such. There is loads more, and most of it has probably not been reported. To be honest, I don't see his views as that different than those of many conservative GOP Congressmen. But no liberal should be singing this guy's praises when he holds such racist opinions and feels open enough about them to write them in a newsletter. Whoa, good information. Thanks for sharing it.